Transparency Market Research (TMR) has published a new report titled, “Osteoarthritis Drugs Market - Global Industry Analysis, Size, Share, Growth, Trends, and Forecast, 2018–2026”. According to the report, the global osteoarthritis drugs market was valued at US$ 5,621.3 Mn in 2017. The market is anticipated to expand at a CAGR of 7.9% from 2018 to 2026 and reach US$ 11,226.1 Mn by the end of the forecast period. Rise in old age patients, upcoming novel treatments, and high unmet medical needs are expected to augment the global market from 2018 to 2026. 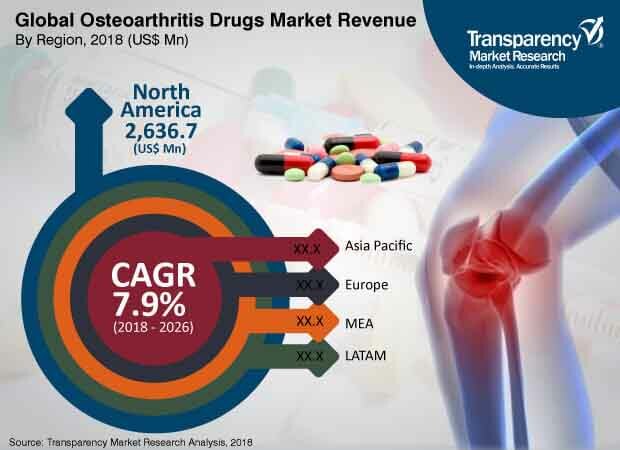 The global osteoarthritis drugs market is projected to expand owing to higher investments by companies, urge for better treatments, and developing healthcare infrastructure in various economies. According to the Arthritis Foundation, 130 million individuals around the globe are expected to be affected by osteoarthritis by 2050. Geriatric population and high prevalence of obesity are likely to continue to contribute to the increasing prevalence of osteoarthritis, placing a major burden on individuals, health systems, and social care systems across the world. Rise in incidence of osteoarthritis is expected to boost the demand for improved drugs and new therapies. Obesity is considered a risk factor for osteoarthritis, especially knee osteoarthritis. According to the World Health Organization, the prevalence of obesity has nearly tripled since 1975, globally. In 2016, more than 650 million adults and 41 million children, under the age of five, were obese. Osteoarthritis (OA) is the most common arthritis condition and is a major cause of impaired mobility and disability among people. Currently available treatment options are insufficient, as they primarily focus on symptoms relief and pain mitigation. There are no drugs available that can cure, reverse, or halt disease progression. Several patients are unable to find relief through the currently available medicines and continue to suffer in pain; therefore, there is high need for innovative treatment options for osteoarthritis. However, high cost of viscosupplementation and increasing competition from generic drugs are restraining the market. Furthermore, withdrawal of opioids has also negatively affected the market share of various companies, globally, owing to abuse of opioids as a pain reliever. The osteoarthritis drugs market has been segmented based on drug class, route of administration, distribution channel, and region. Based on drug class, the market has been classified into corticosteroids, NSAIDs & others, and viscosupplementation agents. Viscosupplementation agents consist of hyaluronic injections available in five, three, and single form of injections and is completely utilized to manage osteoarthritis. Rise in demand for viscosupplementation agents is due to their effective and rapid pain relieving property. The viscosupplementation agents segment accounted for a higher share of the market, in terms of value, than NSAIDs and corticosteroids segments. It is likely to expand at a rapid pace in the near future. North America dominates the global market owing to rise in demand for hyaluronic injection as pre-eminent choice of treatment. North America is expected to lead the global osteoarthritis drugs market, and account for a significant share, by the end of 2026. Increasing prevalence of osteoarthritis in patients, rising healthcare expenditure, increasing investments, and high preference for viscosupplementation over traditional medication are key factors that are anticipated to boost the global osteoarthritis drugs market in the next few years. Innovative therapy and upcoming product launches in North America are expected to propel the osteoarthritis drugs market in the region, followed by Asia Pacific, and Europe. Few companies are investing to expand their footprint in the U.S. by launching viscosupplementation products. ANTI-NGF, known as anti-nerve growth factor, is a unique upcoming therapy for osteoarthritis. Anti-nerve growth factor with antibodies is a promising way to treat the chronic pain associated with osteoarthritis. Strong pipeline investments is a major opportunity for the global osteoarthritis drugs market. Disease modifying osteoarthritis drug (DMOAD) is seen as an opportunity for companies to strengthen their portfolio and enhance their presence in the osteoarthritis drug market. This drug improves the joints function and inhibits the structural disease progression. No DMAOD has been licensed till date, worldwide; therefore, companies investing in this therapy have the chance to create a growth wave in the osteoarthritis drugs market. Development of disease modifying therapies offers considerable market opportunities for osteoarthritis drugs. Nanobody is another promising therapy to treat osteoarthritis disease. All these upcoming novel therapies are seeking to bring a chance of providing effective treatment to the patients. Investments by key players is driving the osteoarthritis drugs market. Key players dominating the global osteoarthritis drug markets are Horizon Pharma plc, Pfizer Inc., Sanofi, Anika Therapeutics, Inc., Ferring B.V., Bioventus, Inc, Chugai Pharmaceutical Co., Limited, Alkem Laboratories, Flexion Therapeutics, Inc., and Zimmer Biomet Holdings, Inc.
Key players are focusing on mergers & acquisitions and exclusive distributorship rights to expand their footprint in the global osteoarthritis market.